Looking to lose body fat, while maintaining your hard-earned muscle? Hi-Tech Pharmaceuticals Stimerex-ES is a popular weight loss supplement that targets stubborn body fat storage in abs, thighs, and other pesky areas. The formula contains a synergistic blend of Ephedra, Yohimbe, and Green Tea Extract, providing sustained energy, appetite suppression, and significant fat loss. 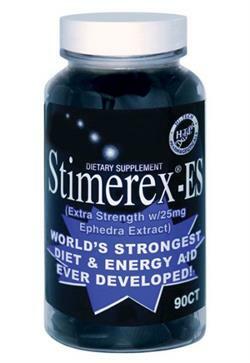 Stimerex-ES stimulates thermogenesis, ramping up your metabolism while supporting clean, jitter-free energy. Energy and fat loss are important parts of achieving your goals, but food cravings, stress, and mood are issues people readily experience during dieting. Stimerex-ES contaings ingredients that support your mood and cravings so that you can lose weight without experiencing an emotional roller coaster in the process. If you need a boost for your cardio or weight-lifting session this is a great product. The 25mg of ephedra extract you get in each serving will help you take your workouts to the next level! Where Can I Find More Information About Stimerex ES and Other Ephedra Prodcuts? Take 1 capsule three times per day. Start by taking one capsule to access your tolerance. Can be used by men and women. Do not take more than 4 capsules in a 24 hour period. It is not recommended to stack this product with another stimulant or ephedra based fat burner, especially stronger products like Lipodrene. We recommend stacking it with Hi Tech Pharmaceuticals Green Coffee Bean Extract, Garcinia Cambogia and/or Raspberry Ketones. Not for use by individuals under the age of 18 years. Do not use if you are pregnant or nursing. Individuals who consume caffeine with this product may experience serious adverse health effects. Individuals who are sensitive to the effects of caffeine should consult a licensed health care professional before consuming this product. Sale to persons 17 years of age or younger is prohibited. In case of accidental overdose, seek professional assistance or contact a poison control center immediately. Avoid alcohol while taking this product. Do not exceed recommended serving. Exceeding recommended serving may cause serious adverse health effects, including heart attack and stroke. Discontinue use and call a physician or licensed qualified health care professional immediately if you experience rapid heartbeat, dizziness, severe headache, shortness of breath, or other similar symptoms. Improper use of this product may be hazardous to a person's health. Exceeding recommended serving will not improve results. Do not use if outer seal or inner cap seal is broken or missing. Keep out of reach of children. Other Ingredients: Microcrystalline Cellulose, Dextrose, Sodium Starch Glucolate, Magnesium Stearate, Stearic Acid, Silica, FDandC Blue No. 1, FDandC Red No. 40.